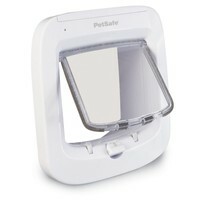 The Petsafe Staywell Microchip Cat Flap has been designed to allow your cat easy access to the outside world whilst keeping other troublesome cats and animals out of your house. The cat flap uses a radio frequency identification technology to read your cat’s unique microchip number without the need for a collar or accessory. When your cat approaches the cat flap it will respond by only allowing your cat to pass through it; remaining locked and denying access to cats that are not programmed, wild animals, pests and strays. The Petsafe Microchip Cat Flap reads the most common type of FDX-B Microchip implanted in cats and can be easily programmed for up to 40 microchipped cats.